Coming up with different ways to style fishnet stockings is quite fun, this is the third week in which I'm dedicating an outfit post to them. Until now they were the star of the show, however they can also be worn subtly while adding an interesting vibe. They are barely visible, yet still catch your eye. 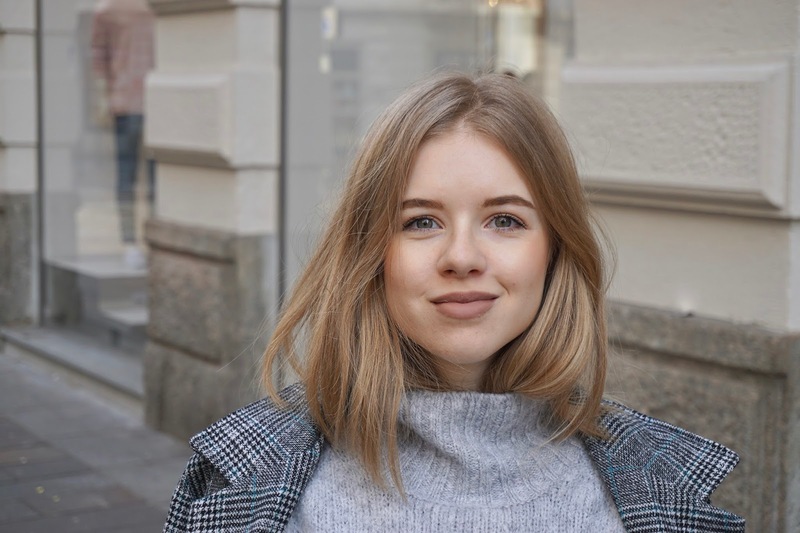 This outfit is very laid back and comfy, combining trousers and a fluffy turtleneck sweater. As you'll notice, I rolled the trousers higher to make the fishnet tights more visible. For a pop, I added my snake statement ring, but also this new coat. From far away you would think it's just a simple black and white tartan coat, however if you look closely you'll notice the blue line running through it. You guys know how much I love simple/minimal pieces with unexpected yet special details, so this had to be mine. Not just because of the colourful surprise, but also because that colour happens to be teal. It was made for me! What do you think about this look? It's very me when I want to dress up simply and comfortably. Love this outfit, you are styling the fishnets really well. Nice styling, reminds me of Alexander Wang.. Love the classic Chucks too! You look beautiful as always! I still need to figure out how to style fishnets. You did a great job here. You styled it so well! You are so beautiful! And your outfit looks amazing! Wonderful outfit, you are so beautifuL! I love seeing how big of a comeback fishnet tights enjoy right now! I love each styled look I saw with them so far. Great job! Love how you styled the fishnets. Your lip color is perfect too. Love everything about this look, such a gorgeous coat! The fishnets are the perfect addition! Fishnet stockings are absolutely everywhere these days! And done so tastefully! Loving the fishnet peekaboo in your look ! you're working them pictures ! Absolutely loved how you styled the outfit! Who knew you can add fishnets to an elegant outfit without making it look OTT! Love! I love this comfy chic look with the fishnet detail! Very sweet street style! Amazing grey coat! Your coat is amazing, I love how you styled it! You are absolutely gorgeous! I love the outfit and it suits you perfectly! What a beautiful coat! I love the subtle pop of blue, such a lovely shade and it goes so well with the naturals, such a great contrast! I also love the way you've styled your fishnets here, having them peek out on the bottom with your sneakers. 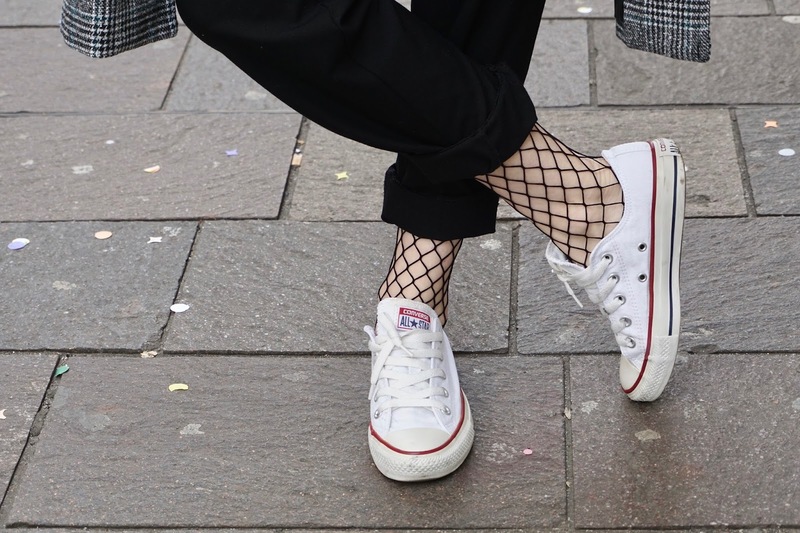 I love when something is trending hard because we tend to see so many different variations and styles and you're right, fishnets can be worn and styled in so many ways! Thanks for sharing and I hope you're having a very Happy Tuesday so far! Love the fishnet and comfy layers, the outfit overall looks great. Hope you have a lovely day. The subtly of the fishnet looks really nice in this outfit! What an awesome styling idea, great photos too! Lovely Outfit.You look so beautiful in it. Wonderful! I love the style! You are gorgeous! I'm a turtleneck lover so loovve this look. The coat is gorgeous as well. Love how you're rocking the fishnet trend in a more subtle but chic way! This outfit is absolutely on point. Your coat is gorgeous! I loved the coat and the fishnet tights... what or a lovely way to wear them, and I also liked the sneakers! You always look super sweet, very beautiful. Always with a chic outfit! Hope you have a very lovely day! Loving that coat! Need! I've always wanted a clean cut, tailored looking coat. Very chic! Such a chic outfit! You look fab! I love this edgy yet dressy look! High fives! Gorgeous photos of you babe! I'm 100% on board for fishnets of any kind right now, and your styling is great here. So fabulous! Loving the color of your hair! Love this look! Such a pretty outfit! You look beautiful. Love your ring!